Title of the world-famous song by French singer Édith Piaf, “La vie en rose” means “life through rose-colored glasses.” In the lyrics, the artist describes how beautiful life has become since she met her new love. This bouquet is hand-delivered in a gift-wrapped glass vase. We print your note on our gift card and tuck it securely to the side of the arrangement. When you want to send beautiful flowers that will make a statement and leave your loved one speechless, our pink amour bouquet is the perfect option. This bouquet includes premium pink long-stemmed roses from eco-friendly farms in Ecuador that provide one of the best growing experiences for our fresh roses. The total diameter of this bouquet is about 20” while the stem length is between 20 and 24”. We take special care to hand-deliver this bouquet in a gift-wrapped glass vase with flower food and instructions to help keep these blooms looking stunning for four to five days. Amour is the word for love in the language of love, so it makes sense that this pink bouquet would serve as the perfect gift for the person you love most. Pink roses symbolize a deep appreciation and admiration that comes with loving someone for years. Give our amour pink bouquet to your wife on your anniversary or your mom for Mother’s Day. Whoever receives it will remember your gesture of love and kindness for a long time to come. 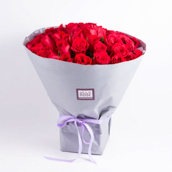 Order your amour pink bouquet from Ode á La Rose today to get same-day delivery in NYC or Chicago. If you live in a city in the Northeast, we can deliver your bouquet the next day during weekdays.